The Best Green Eating Cookbooks of 2017 - Seasonal & Sustainable! A collection of the best 2017 green eating cookbooks featuring seasonal and sustainable recipes and ingredients from around the world. Cookbooks, for me, are a slippery slope. Don’t get me wrong–I love everything about them. From the photos to the stories to the book design and even the paper used, I love to spend a weekend morning pouring over a cookbook and devouring it in its entirety. All of this before even attempting to cook a recipe. But the problem is that I love cookbooks too much and soon enough I have a collection of books I’ve never read that sit on my (very tiny) kitchen counter and take up space. There are times that choosing to live a minimalist lifestyle is a burden and cookbook collections are one of those times. So I must ration my cookbook purchases. I allow myself one every few months, which I’ve deemed the proper amount of time to fully immerse myself in a good cookbook and find my favorite recipes and new techniques. Because I’ve put myself on a strict 4-6 cookbooks a year rotation, I am choosey about the books I buy and love to stay on top of the trending new cookbook releases. So what better way to wrap up the year in cooking than to share with you my recommendations for green eating cookbooks featuring seasonal and sustainable eating recipes from 2017? Six Seasons is not only a book full of recipes, it’s a book full of knowledge. Of plants, of the earth, of the soil, of the seasons. This is the sustainable eating book for those of us who do our best to cook with what the earth is giving us right now. In the season and location and life place that we’re in. Who said seasonal eating and vegetables are boring? Not if Joshua McFadden has something to say about it. This is one of my favorite cookbooks of the year not only for its deliciously easy recipes for cooking at home, but for its simple yet bold photography. Roman, an alum of Bon Appetit magazine, makes cooking and entertaining in a tiny urban apartment seem like a breeze and her recipes are at once both basic (in the best way) and imaginative. San Franciscans have been raving about Nopalito for years and now the Mexican restaurant has reached international fame. I remember my first time at Nopalito quite well; I skipped nutrition class one afternoon to sip margaritas and eat delicious flautas with a classmate who has since become my San Francisco restaurant partner-in-crime. I returned many times and each was better than the last. I love this cookbook because it doesn’t clump all Mexican cuisine together in one category, but instead explains its intricacies by region and city. I also love the bold photography and typography, because I’m a sucker for good design. If you can’t make it to SF to eat at Nopalito, get yourself this book and taste a little bit of Mexico in your own home. You know how sometimes you flip through a cookbook at the bookstore and everything looks great but then you ask yourself, “Am I honestly going to cook anything in this book?” And then answer is no, so you walk away. Well, Dinner by Melissa Clark is not that book. Dinner is the book you pick up again and again on a weeknight and know that each and every recipe will be a solid winner both on the table that night and in the lunch pail the next day. And that’s the kind of book that qualifies for a spot on my kitchen counter. Ok, this one wasn’t released in 2017 but I bought and read the thing from end-to-end in 2017, so that counts, right? While Bourdain has many books under his belt, this is his first in 10 years and his first in his role as not only a chef but also an avid traveler and he shares many of his travel eating recipes and stories in Appetites. He weaves his food stories in his no-nonsense habit that rubs many the wrong way, but I think this cookbook is a great example of not being traditional and stuck up one’s own you-know-what. And that’s a great quality in chef, in my opinion. Have you tried my 2017 recommendations for green eating cookbooks? Do you have a seasonal and sustainable food cookbook recommendation of your own? Leave a link to your favorite green eating cookbooks from 2017 below! Ooh I’m trying to add a few more veggie meals in to my weekly food planning so this has given me some great ideas for places to start. Thank you! That’s great! There are so many great plant-based and plant-forward recipes in these cookbooks, you really can’t go wrong with any of them! Good to know the books. Do You recommend Julia Child’s books for a vegetarian meal? Please guide. 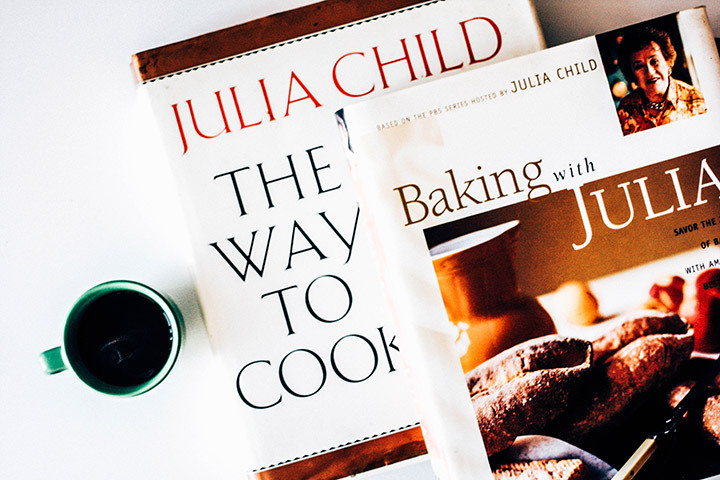 Julia’s books are definitely classics and I highly recommend them to learn about classic cooking. She does have many vegetarian meals in her books as well so they should be great resources whether you’re a meat eater or not.